Are you thinking of making a start in the construction industry and not sure which way to go, why not think about a career as a wall and floor tiler. The construction industry is back on its feet again after the downturn in 2007 â€“ 2012, things are going from strength to strength with most trades in demand due to short supply of tradesman. There is no better time than the present to start a lucrative career as a wall and floor tiler. Tiling plays a big part in construction, think about all the kitchens that need tiling, all the floors in hallways and conservatories, all the bathrooms that are getting re modelled, you could be completing all these jobs. As a tiler you would charge by the metre therefore the more tiles you lay the more money you make, a good tiler can lay up to 20 metres a day and with fitting charges at Â£15 â€“ 20 per metre you can see that tiling can be a well paid job. 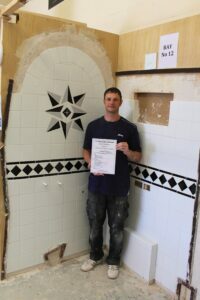 The easiest way to start a new career in tiling is to find a good quality training centre, one that covers all the backgrounds and preparation as well as the practical side of the training. 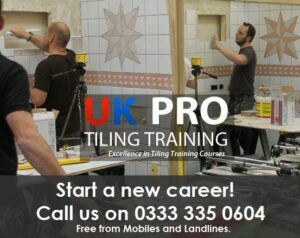 UK Pro Tiling Training is one of the best and the only dedicated professional career changing tiling course in the UK. Here you can train in a realistic environment and learn what it takes to be a self employed wall and floor tiler. We have had thousand of students from all over the UK attend out tiling course over the last 12 years many of them now running their own successful tiling business, you could be one of them.